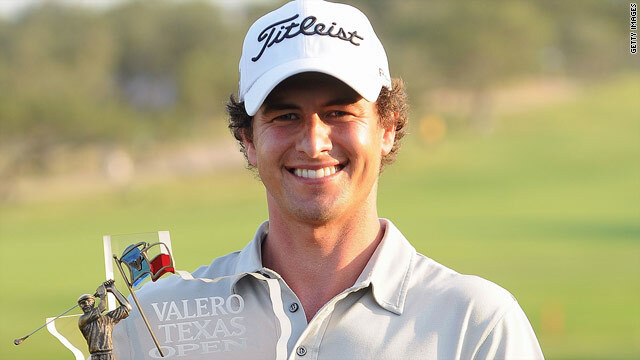 (CNN) -- Adam Scott ended his two-year drought on the PGA Tour with a dramatic one-shot victory on a marathon final day at the Texas Valero Open. The 29-year-old Australian was forced to play 36 holes on Sunday after heavy rain wiped out play on Friday, but responded with blistering rounds of 66 and 67 to clinch the title. Scott's 14-under-par total was enough to see off the challenge of Sweden's Fredrik Jacobson, who failed to sink a 15-foot birdie putt on the final hole that would have secured a play-off. Fellow Australian Aaron Baddeley, Ernie Els from South Africa and American Jimmy Walker tied for third place, two shots off the lead, as Scott recorded his first win on the PGA Tour since the HP Byron Nelson Championship in 2008. Els was the early pace setter but his rounds of 68 and 69 weren't enough to hold off the bid of Scott, who climbed the leaderboard with 12 birdies and an eagle in his final 36 holes. I questioned myself at times last year whether I was a great player or not, I still feel I am. American J.B. Holmes led after round three but sank to a 76 on his final round, dropping four shots on the first three holes. Despite dropping a shot on the final hole, Scott did enough to claim victory. "It was a long old day but when you get hot it's good to play 36 holes sometimes," he told reporters. "Obviously, it wasn't the greatest finish but I played really well after being one under for the tournament after three holes this morning. "On the last putt I was playing it straight and pulled it a touch, it was a bit of a disaster. I questioned myself at times last year whether I was a great player or not, I still feel I am." Meanwhile, Peter Hanson, of Sweden, won the Majorca Open title after beating Spain's Alejandro Canizares in a play-off. Hanson recovered from a one-shot penalty after a slow-motion television camera showed he had hit the ball twice during a shot on the 12th hole. Despite finding himself two shots off the lead he made birdies on the 15th and 17th to force a play-off. The Swede then secured the title with a par on the first extra hole after Canizares made bogey.